Chic but compact apartment, tiny flat or smaller-than-ideal house – whatever your home’s space challenges, these five tips and tricks by Lucy Searle of RealHomes.com will make a mighty big difference. Received wisdom has it that painting walls white makes small rooms look bigger, right? Right – but if you’d love your home to be colourful and spacious-looking, you’ll need a clever trick or two up your sleeve because, the darker the walls, the more they advance visually and the smaller a room feels. The easiest way to get around this? Pick a colour you love then use it on the walls, match it with furniture and pick accessories in close tones of the same shade. That way, you’ll get colour and a spacious feel, plus you don’t need to compromise on your furniture’s size because even larger pieces will blend into the background. We all know that white walls reflect light and make a space feel larger blah blah, but so many of us discount our fifth wall: in other words, picking a flooring that makes a room feel larger. Opting for a finish in a light colour is the most obvious way to go, whether you strip and paint floorboards white, choose a lime-washed look for engineered wood boards, laminate or vinyl, or simply lay down a large white or cream rug. Another, more interesting ruse is to use diagonal lines on the floor to trick the eye into seeing the room as longer and wider than it is; this might mean laying tiles diagonally on the floor or picking a rug, carpet or vinyl with a diagonal criss cross pattern on it. Compact rooms call for furniture that’s in proportion, so choosing sofa beds designed for small living spaces or desks created for small home offices will have an instant impact. 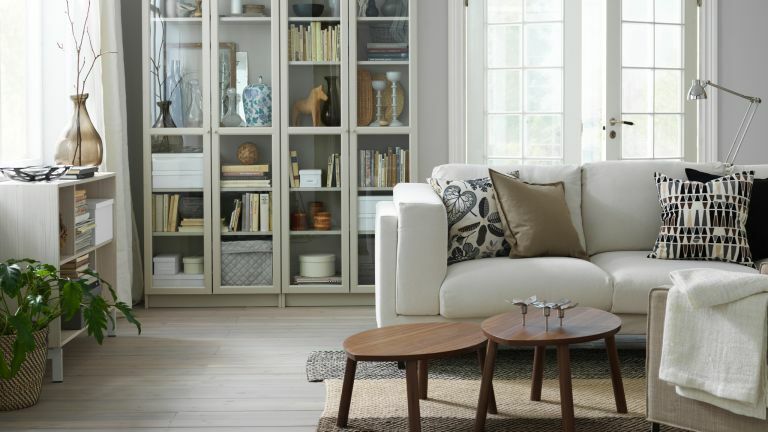 Keeping the balance just right between furnishing sparsely and cramming in too many pieces will give you a room that’s both inviting and spacious-feeling. That’s not all, though. Picking out seating with low backs – whether sofas and armchairs or dining chairs – will make the room feel taller and will allow as much light to bounce around the space as possible (while also looking cooler and more contemporary). Last but not least, picking out furniture – from beds to sofas to bathroom storage – that has its legs on show will help the room feel bigger because it’s less bulky-looking, you can see under it and light can travel under it. There are so many ways you can be clever with what you put on your walls – the only problem is narrowing it down. First, let’s talk wallpaper: choosing a light-coloured design with the narrowest of vertical stripes will exaggerate your room’s height. Bonus. Next, consider what’s on your wall: a mismatched collection of pictures stuck up anywhere is doing you no favours, but arrange photos, pictures and artwork with know-how and you’ve got yourself a feature gallery wall. And what does a feature focal point in a room do? It draws attention to itself, not the room’s less than perfect proportions. Lastly, you can’t ignore the obvious, space-enhancing opportunities of hanging or leaning a great big mirror against a wall. Pick a position for it that reflects the best view of the room back – but bear in mind that if the space is dark, putting it adjacent to a window will bounce the most light back into the room. Banishing big, heavy, dark, light-sucking curtains is a must if you want your rooms to look bigger, but that doesn’t mean you can’t have curtains at all. IF you are going to have them, here’s how to use them to make your room feel larger, not smaller: start by swapping in floor-to-ceiling, light-coloured ones with a subtle vertical stripe (suddenly your room – and window – looks taller); then, ensure you hang them from a pole that’s long enough so that they can be pulled right back past the window frame, making your window will feel wider, too. Curtains not an option? Ditch roller or Roman blinds – both visually shorten the window. Instead, go for space-stretching shutters: they’re sleek and slim, bounce daylight into the room and have that kerb appeal that small homes need help with.